Need a party appetizer in a pinch? We got you covered with simple bites that take minimal time and effort. La Bottega di BelGioioso cheeses help you spend less time in the kitchen and more time enjoying your party. You can’t go wrong with crunchy crostini when it comes to party food. Start with spreading Crescenza-Stracchino on a crusty baguette slice, top with fresh peach slices and garnish with a mint leaf. If you prefer a bit of extra sweetness, top each crostini with a drizzle of honey. Meatballs always seem to be a party favorite and with three simple steps, these will be your favorite to make. You can easily prepare your own meatballs from scratch for these bites, but if you are really in a pinch prepacked meatballs work great too. Simply cook meatballs according to package instructions, remove from oven and spoon warm marinara sauce over each meatball and sprinkle with shredded American Grana®, Extra Aged Parmesan cheese. 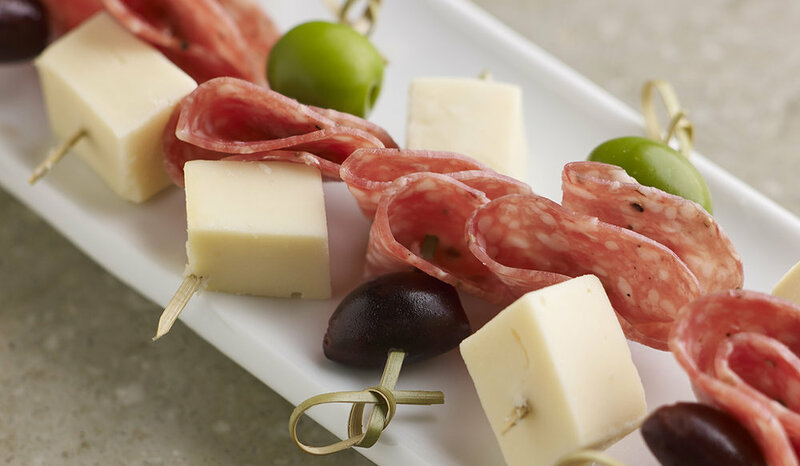 An antipasto platter is always a win; mini antipasto skewers, a double win! Start with bite-size cubes of Provolone Extra, and pair them with thin-sliced hard salami and olives. Elegant and delicious cheese appetizers don’t have to be difficult or time-consuming. With these easy appetizer recipes using handcrafted La Bottega di BelGioiso Cheeses, you can create mouthwatering starters in just a few minutes.